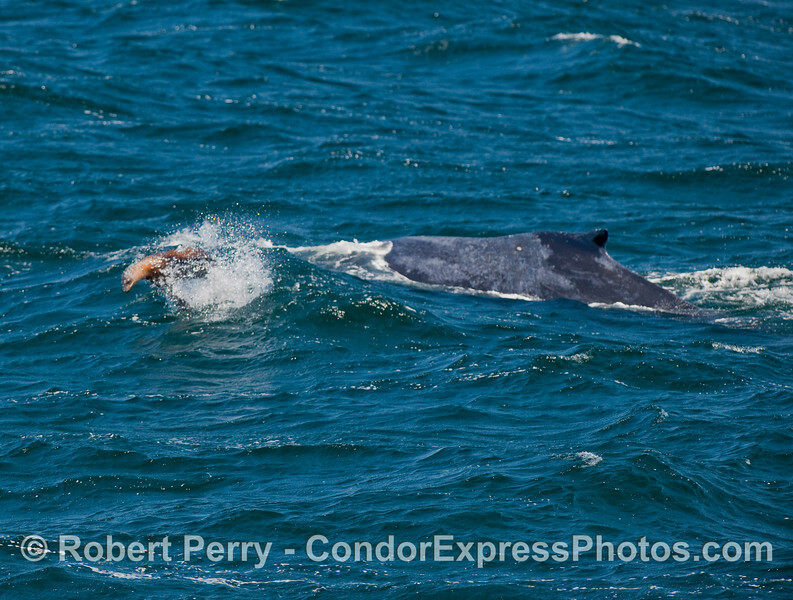 Common Dolphins chasing jumping Anchovies, California Sea Lions pestering Humpback Whales. 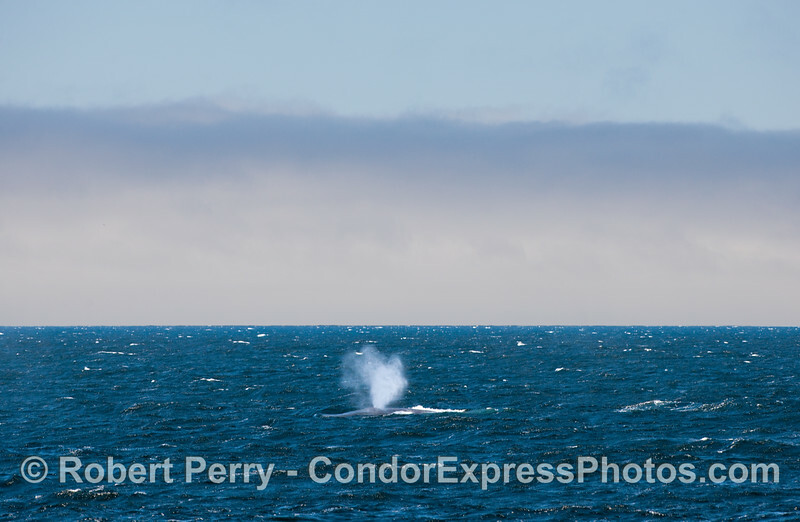 In all: Blue Whales (Balaenoptera musculus), Humpback Whales (Megaptera novaeangliae), Risso's Dolphins (Grampus griseus), California Sea Lions (Zalophus californianus) and Common Dolphins (Delphinus capensis) on a trip up to the west end of San Miguel Island in 25 knot winds. SMOKIN' !! For you geography lovers, click on the "Map This" button above, then click on "Play." 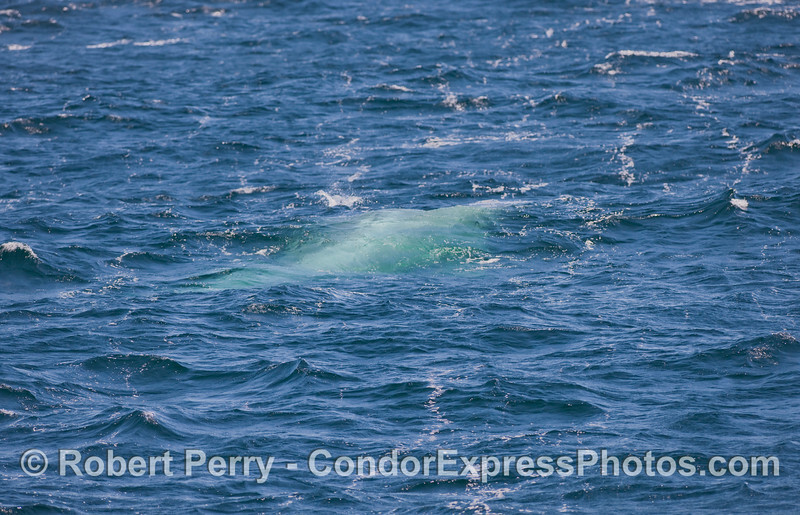 A huge Humpback Whale begins to bust out of a wave. The tip of the rostrum, edge of mouth and tubercles are visible. 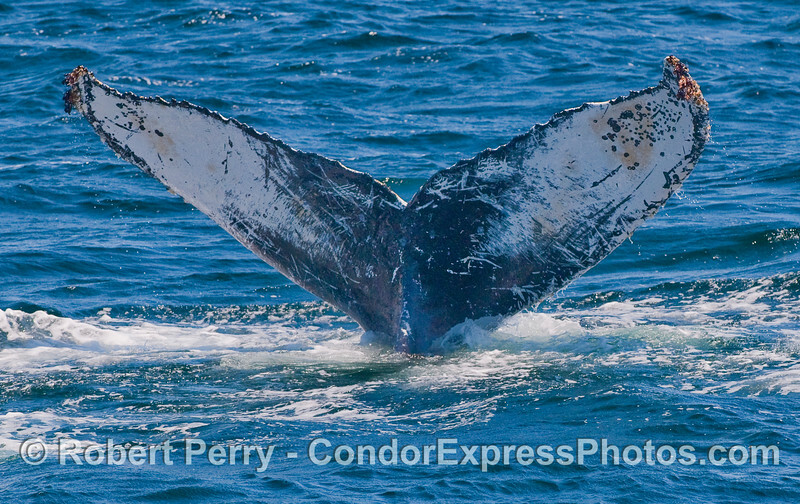 Ventral surface of tail fluke - Humpback Whale. 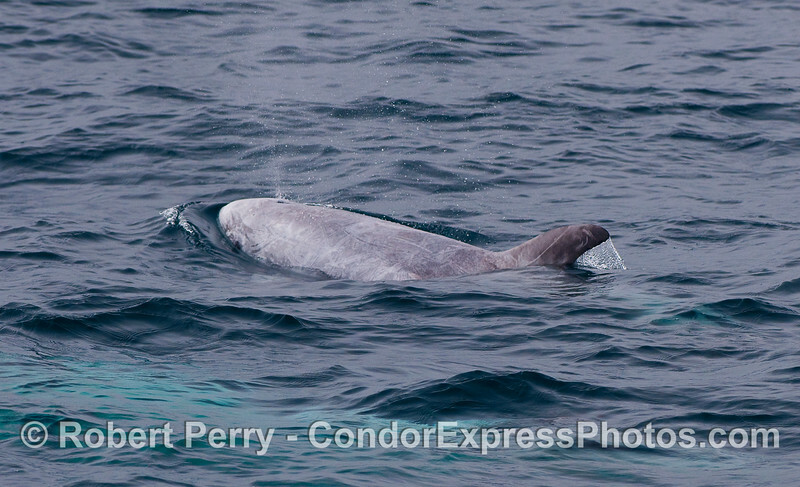 A spout from a Risso's Dolphin. 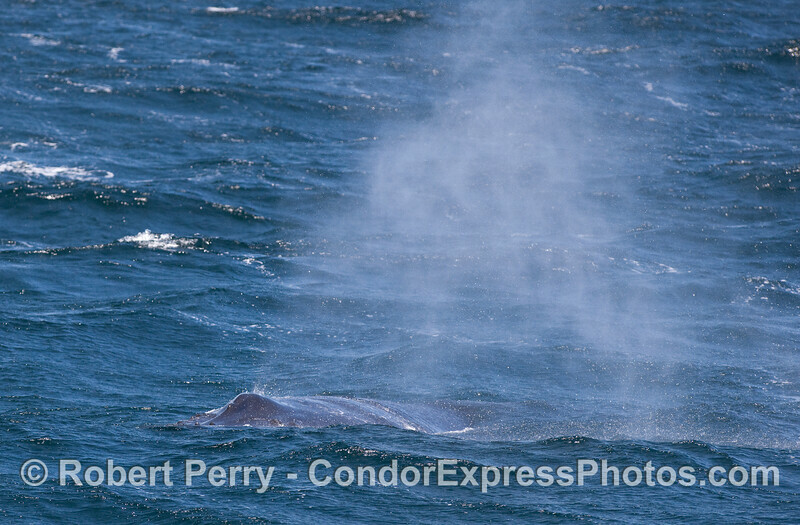 Strong winds blow the spray from this Blue Whale's spout. 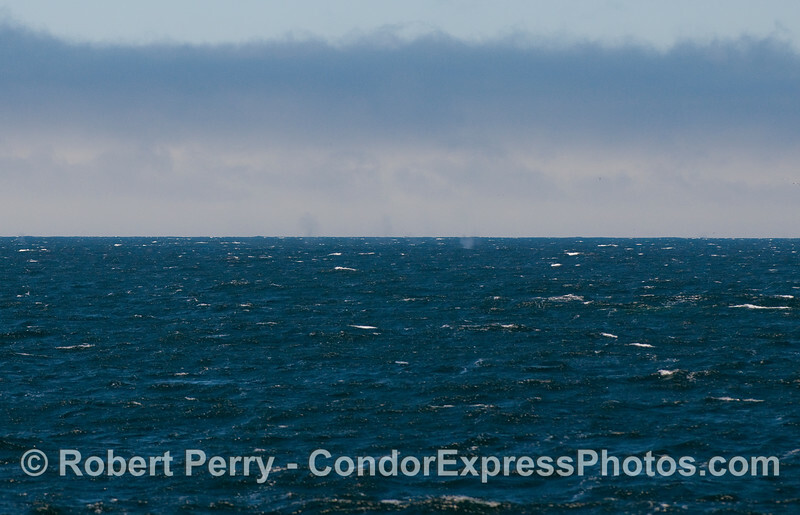 A Humpback Whale tail enroute to the depths. 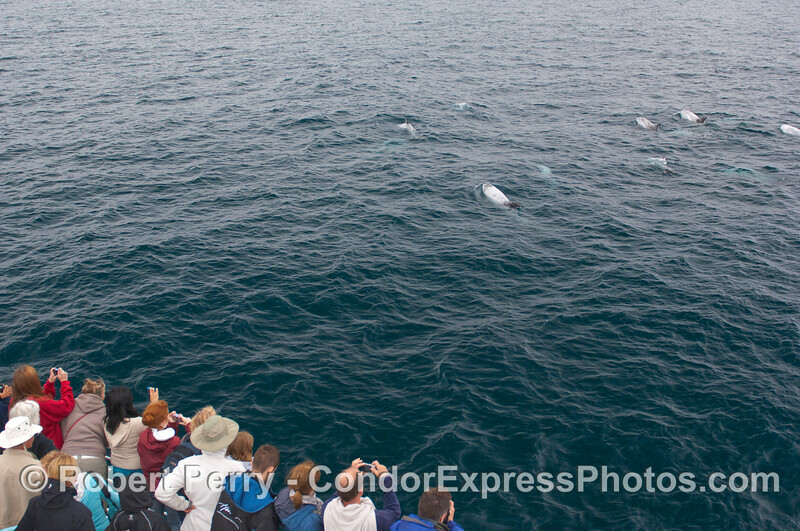 Whalers on board the Condor Express shoot part of a 40-member group of Risso's Dolphins near the bow. 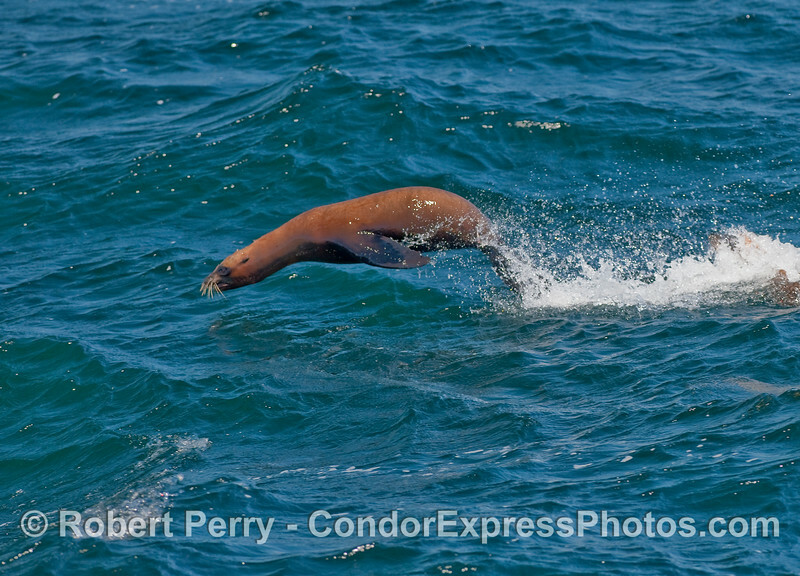 Image 1 of 2: A California Sea lion exhibits its leaping abilities. 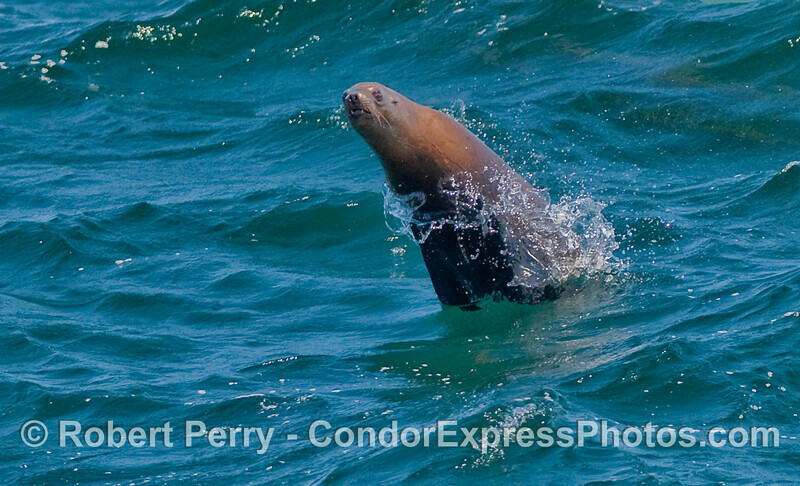 Image 2 of 2: A California Sea lion exhibits its leaping abilities. 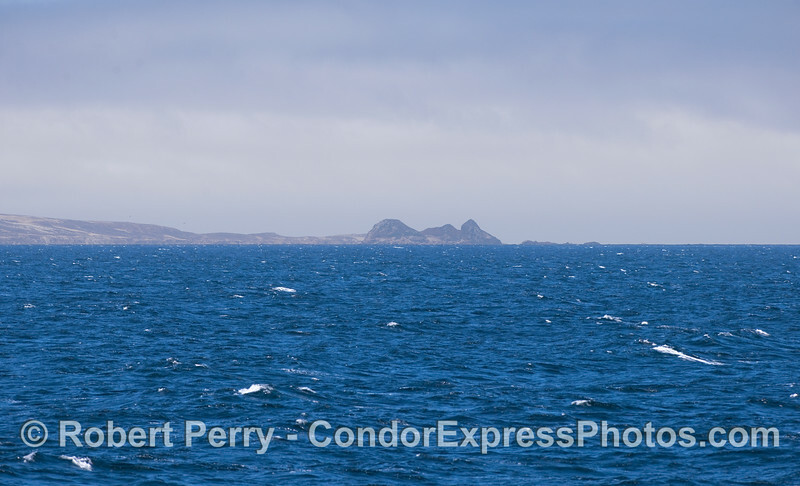 The northwest end of San Miguel Island including Castle Rock. Fish jumpin' ! 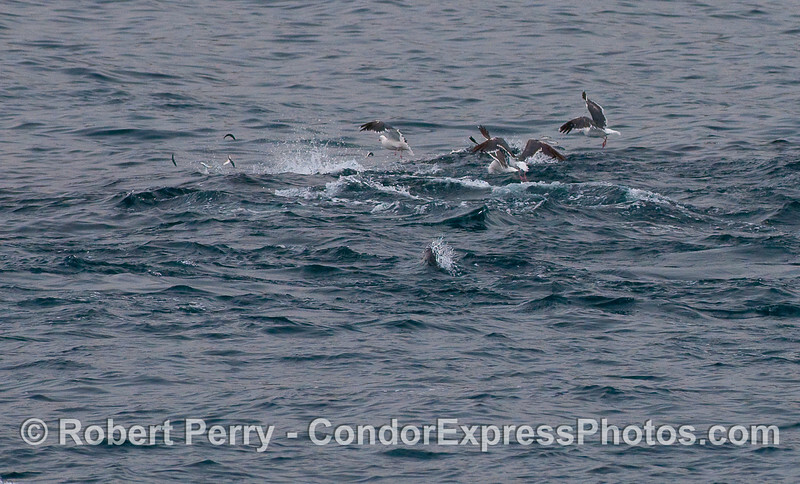 Common Dolphins feeding on Northern Anchovies (Engraulis mordax) with Western Gulls (Larus occidentalis) waiting for the scraps. 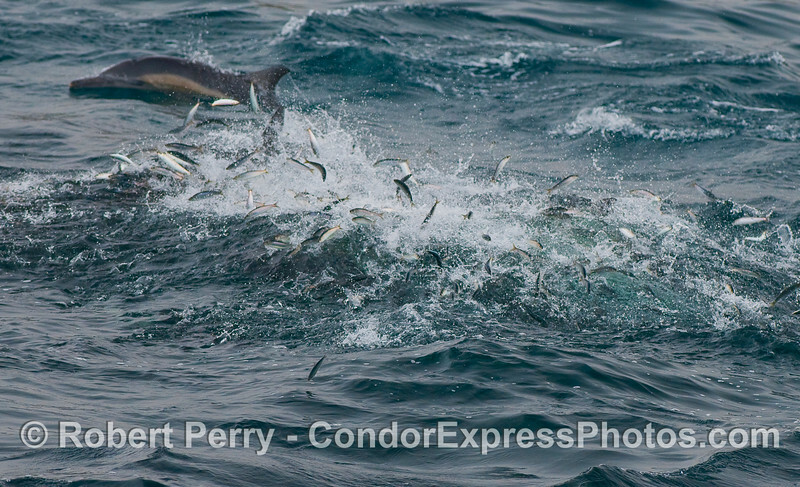 A few dozen Common Dolphins are seen here slashing through schools of bait fish (Northern Anchovies, Engraulis mordax). The anchovies are leaping out of their water for their lives. This is an example of one of the main food chains in the Channel. 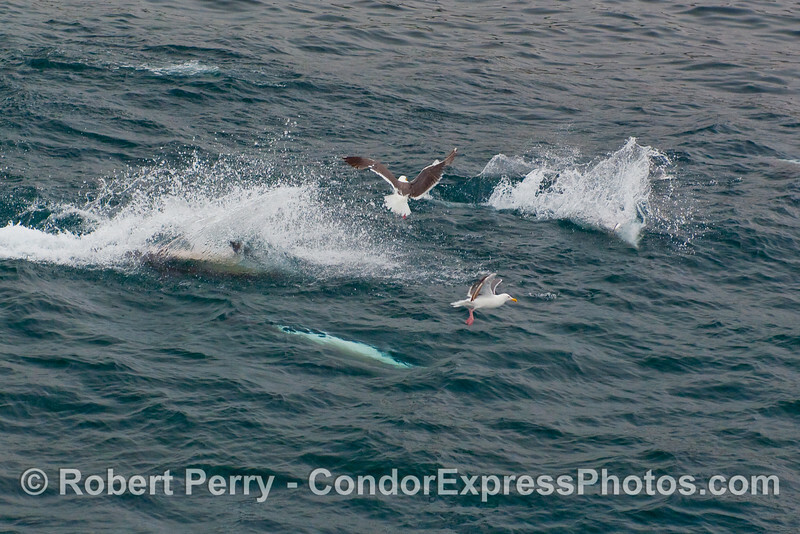 Fish jumpin' and Common Dolpin jumpin'. 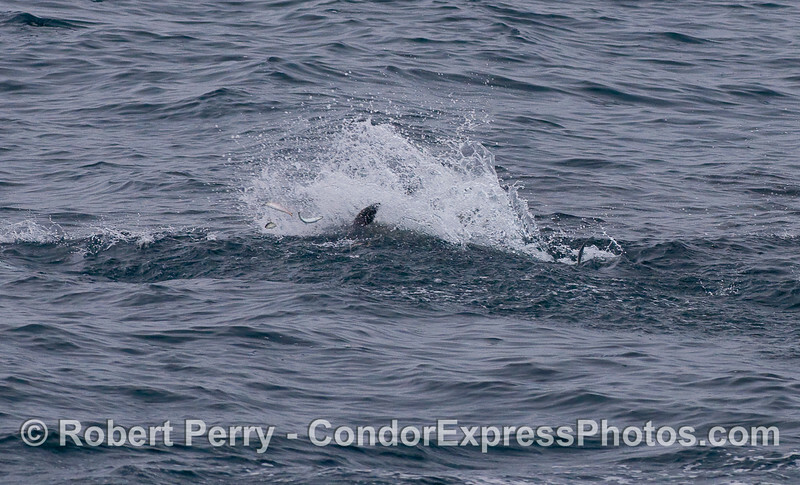 More Common Dolphins swim upside down chasing Anchovies. 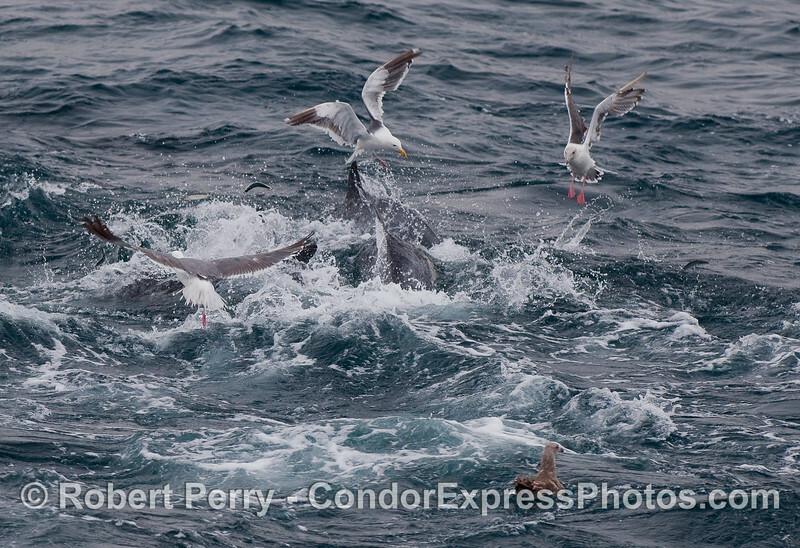 Western Gulls seize the opportunity, as always. 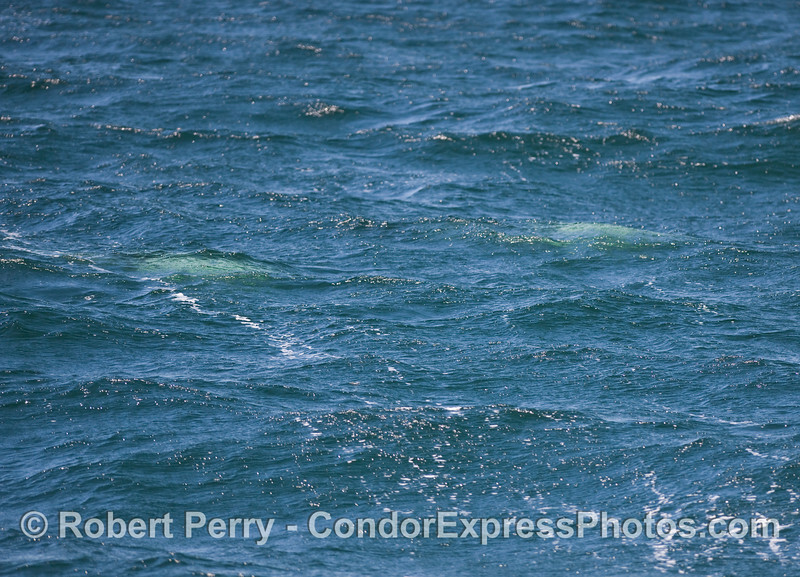 Common Dolpins hunting Anchovies. 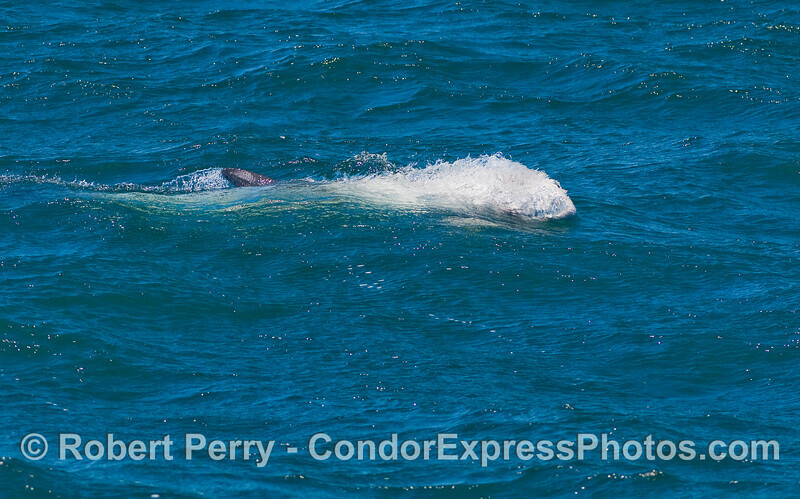 Two burst out of the water to capture fish, another speeds after its prey underwater, upside-down. 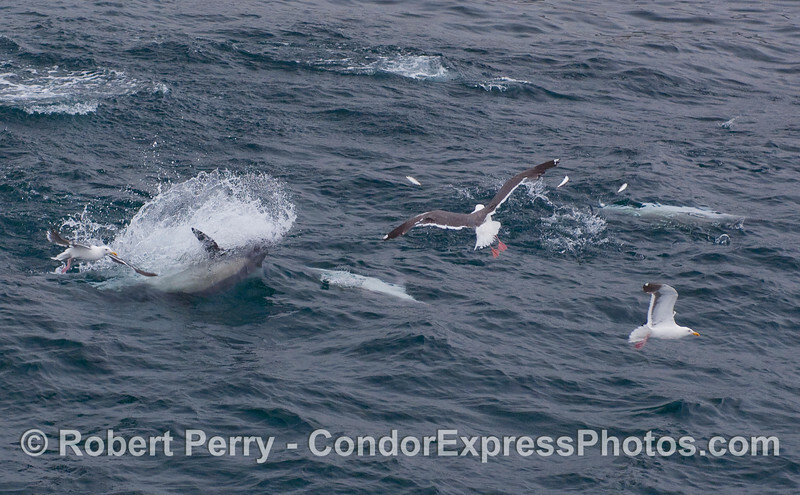 Upside-down feeding leap - Common Dolphin hunting. Anchovies can be seen jumping to the right. Fish jumpin' ! 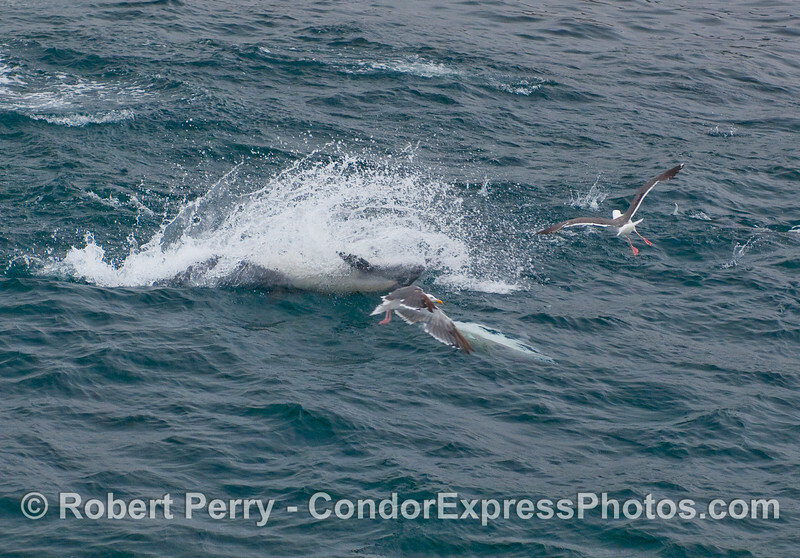 Common Dolphin feeding on Northern Anchovies (Engraulis mordax). 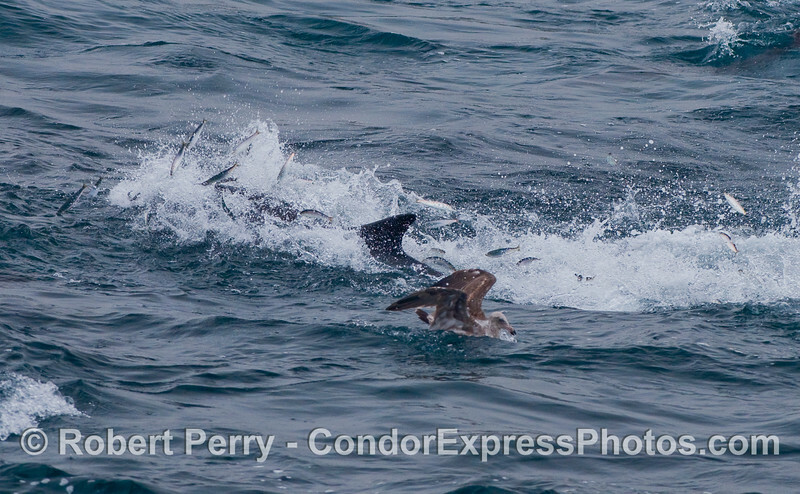 Lots of anchovies leaping out of the water in their attempt to escape the jaws of a speedy Common Dolphin. 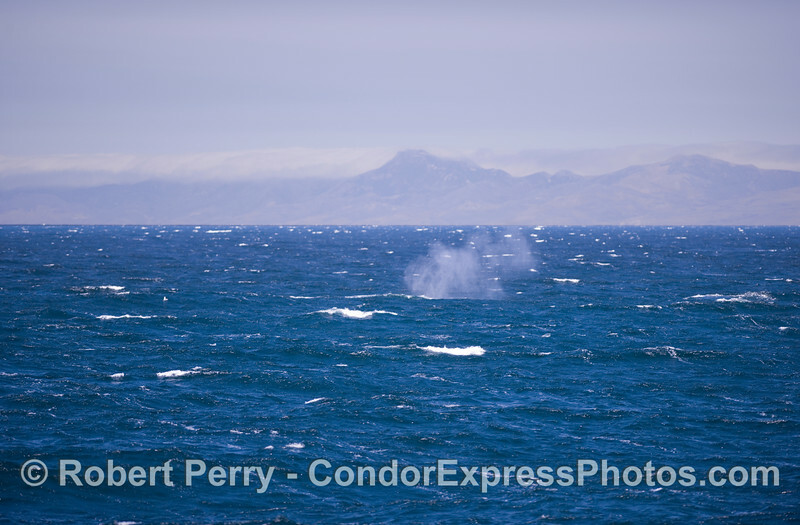 Tips for aspiring whale spotters: Here's a look at the windy, choppy ocean surface north of San Miguel Island. 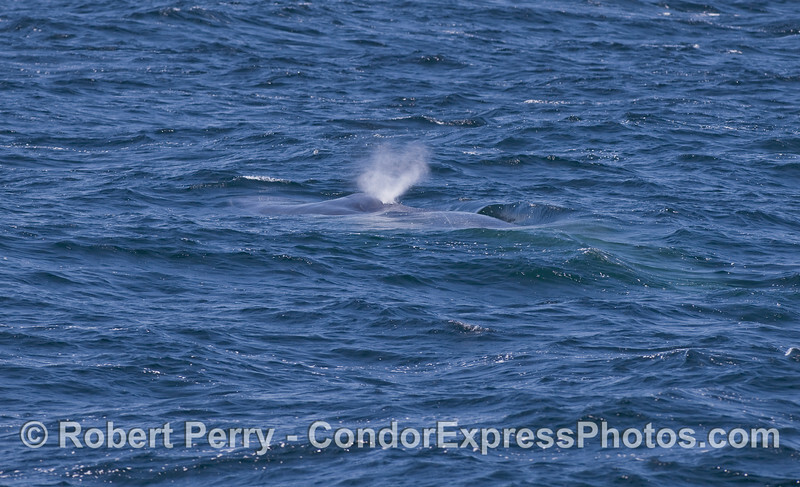 It is a view from the flying bridge of the Condor Express, where the captain and crew members look for whales. 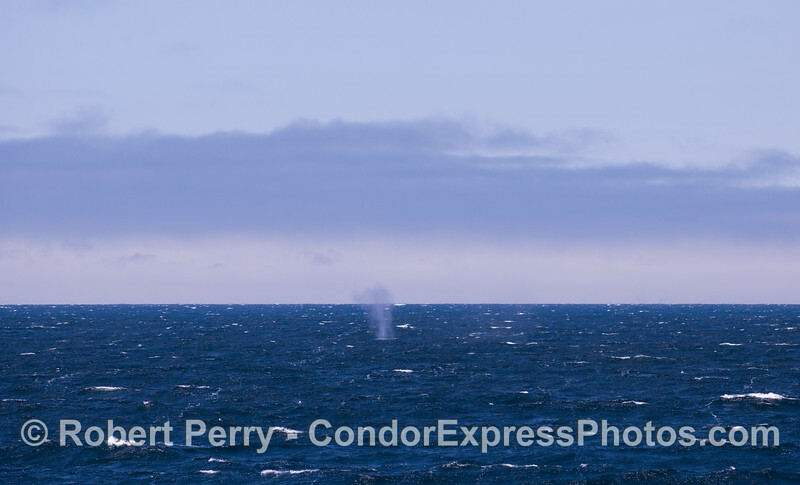 The image has been cropped and enlarged to show the tall Blue Whale spouts in the middle. 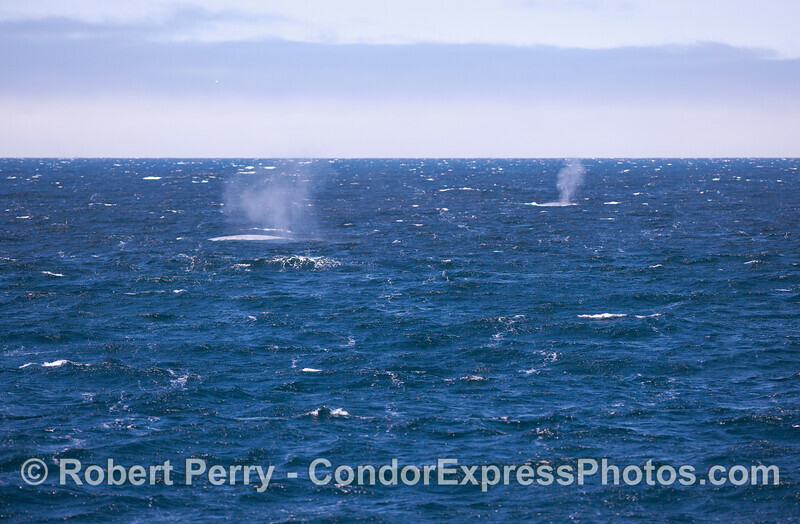 On this day, Captain Mat was spotted these spouts at an approximate distance of 4 miles by looking for the darker, grey spouts against the lighter cloudy background. Polarizing sunglasses, and polarizing camera lens filters, help a lot. 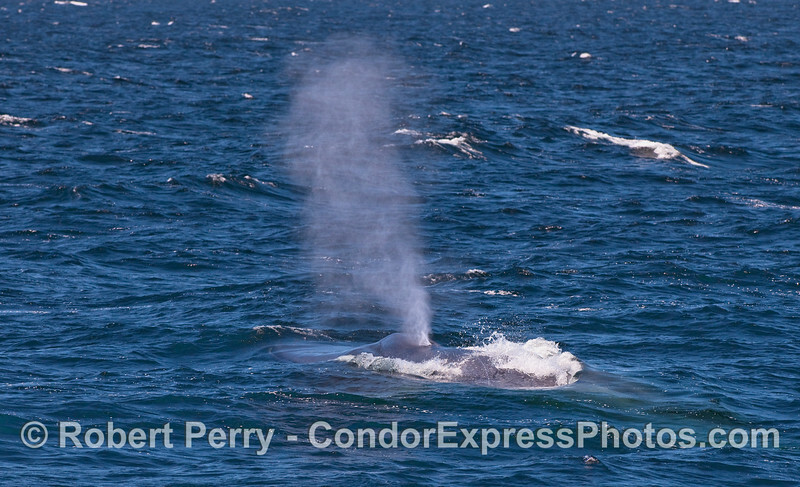 The beginnings of a spout - giant Blue Whale. 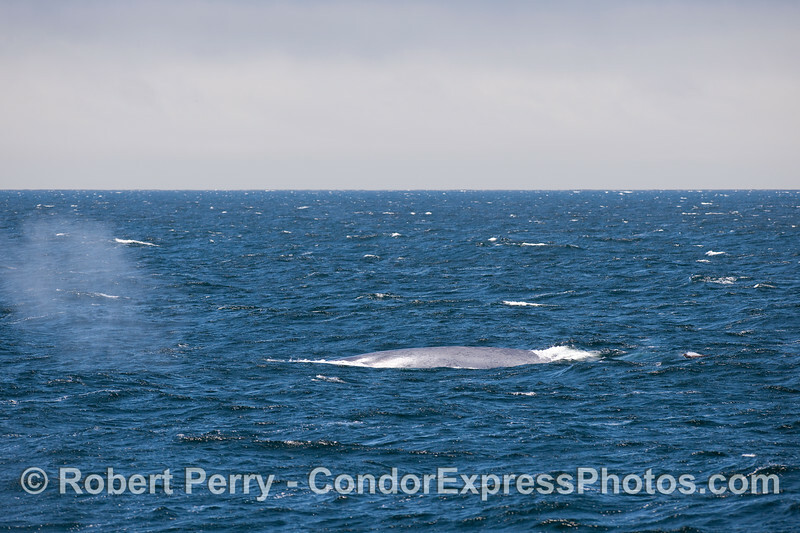 Notice how far the spray from this Blue Whale's spout has blown to the left (east). 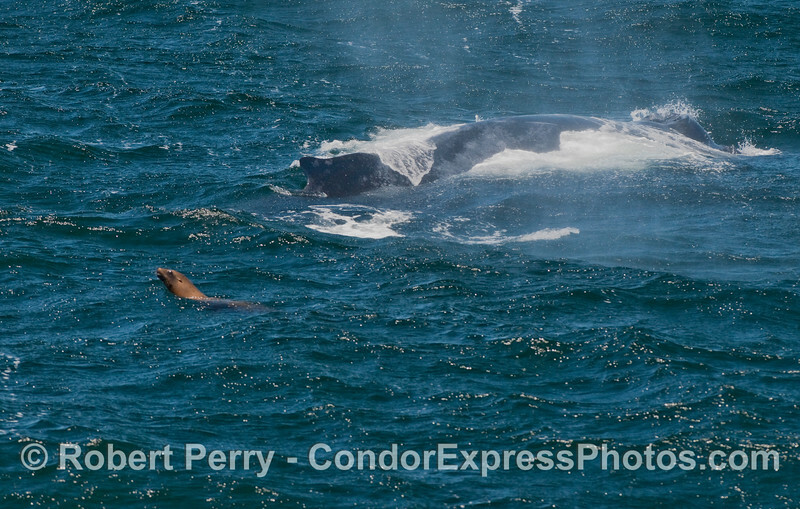 A California Sea Lion leaps out of the way of a huge Humpback Whale. 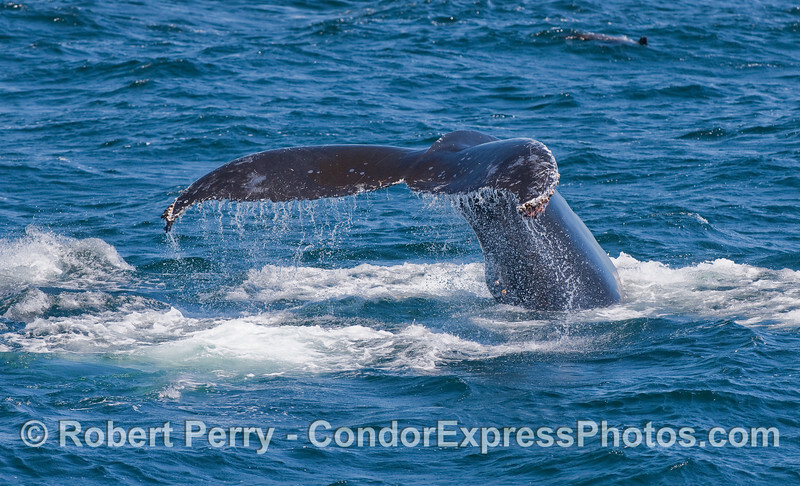 Where prey species are concentrated in the ocean, many different predators share the same feeding grounds. 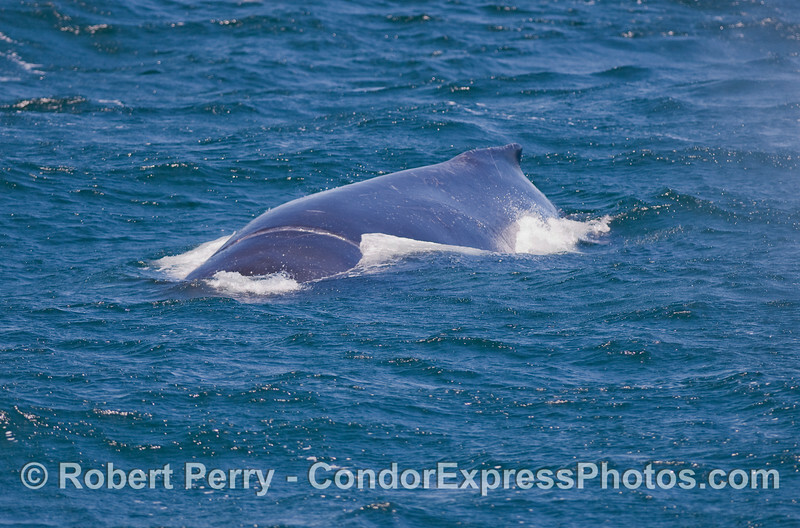 A Blue Whale gets its name from the blue glow when it swims just below the surface. Giant shark fin? No. 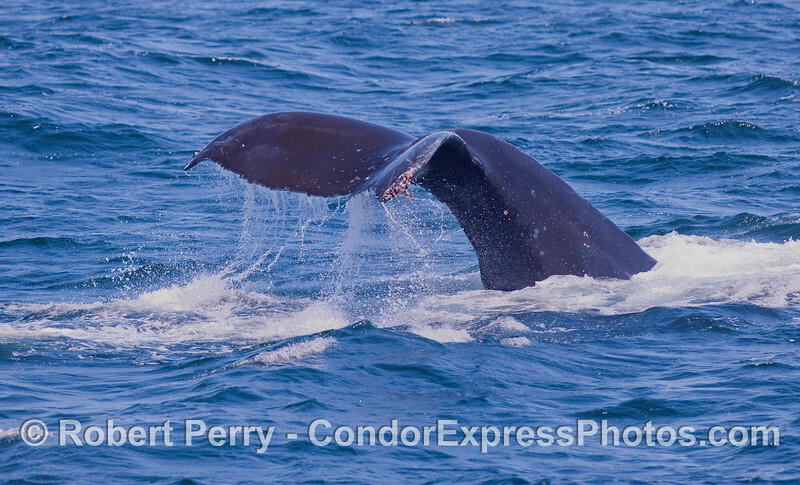 It's a sideways Humpback Whale's tail fluke. 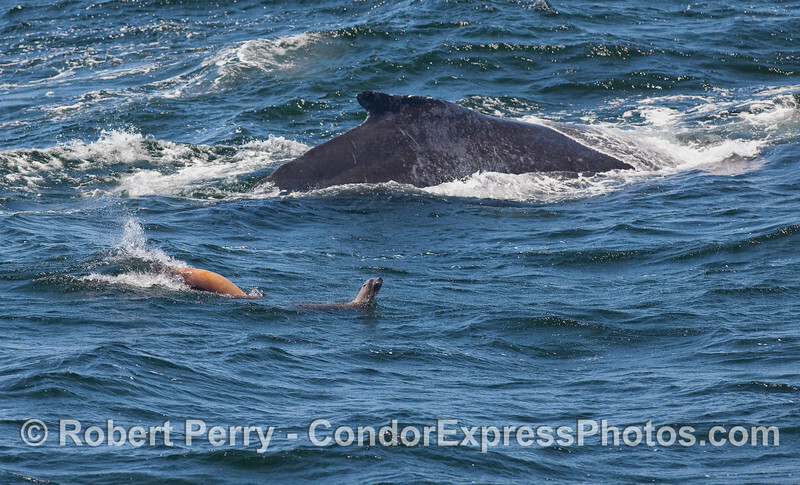 Two California Sea Lions pester a Humpback Whale. 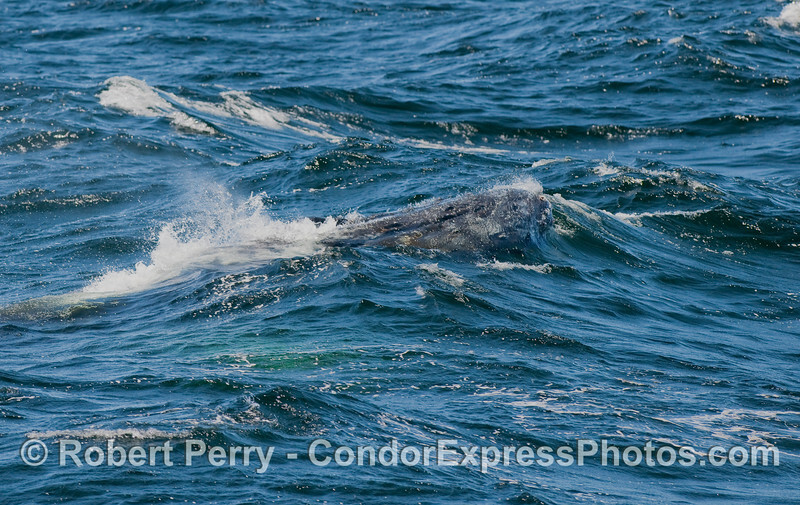 A large female Humpback nicknamed "Rope" (aka, "Poly") shows a prominent entanglement scar encircling its thorax. Crew members have been watching this same individual for several years...and her photos appear many times on this website. 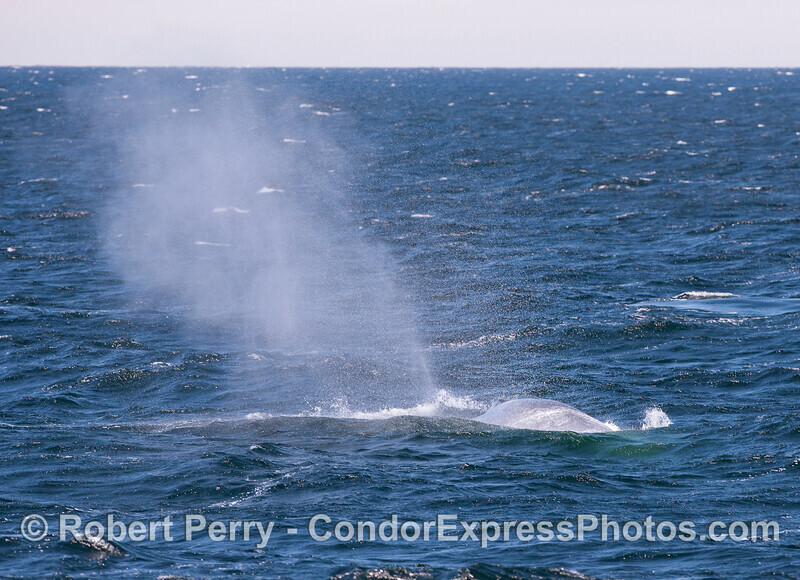 Strong winds blow the spray from this Humpback Whale's spout. 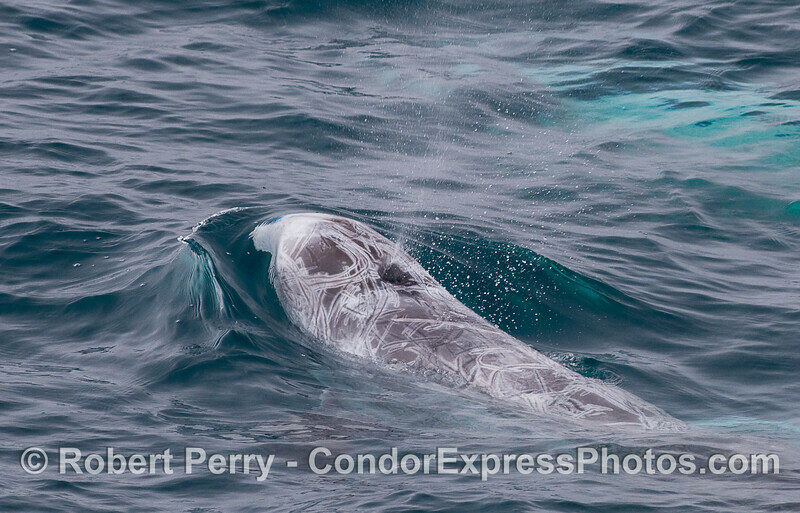 The whale is headed obliquely towards the camera lens. 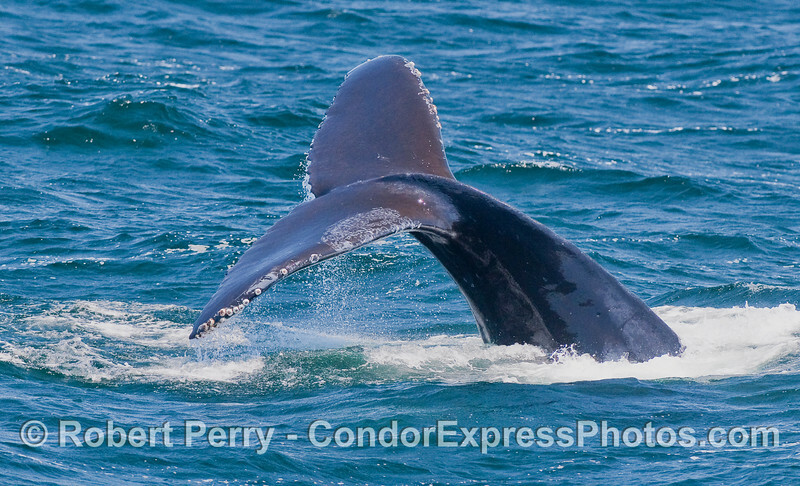 Humpback Whale tail fluke waterfall. 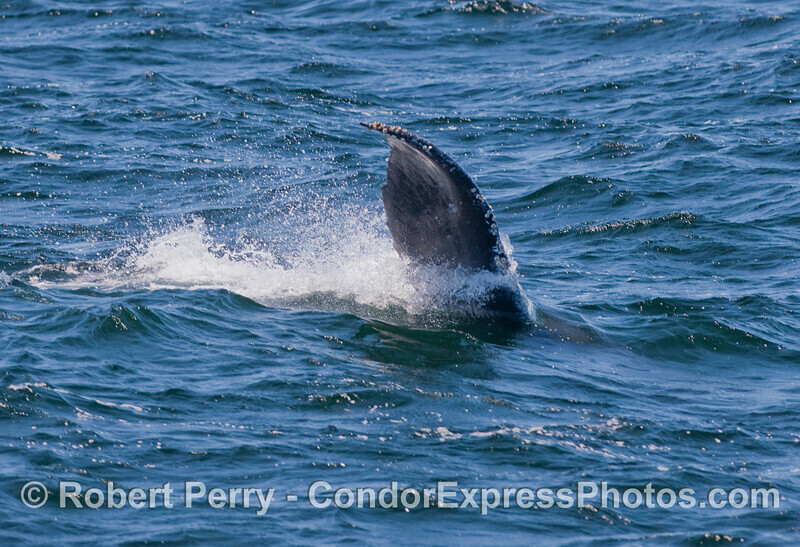 Another Humpback Whale tail fluke waterfall. 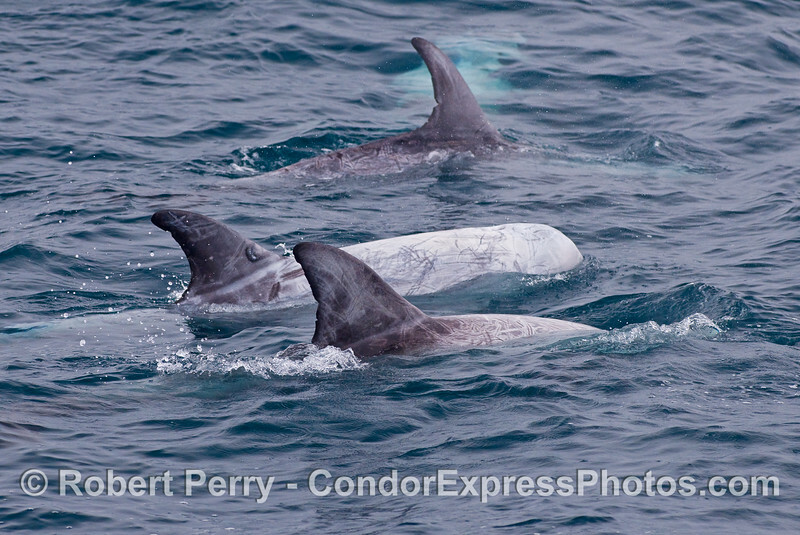 Two Risso's Dolphins travel underwater. 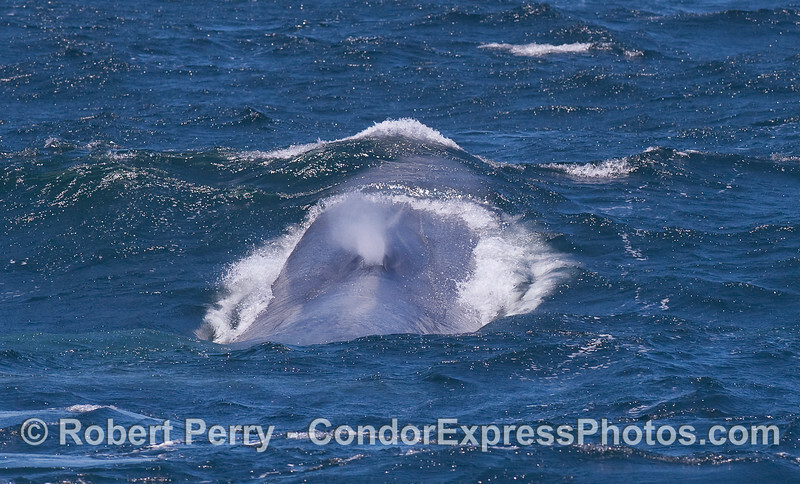 Looking from the back towards the head of a giant Blue Whale which is just starting to spout.